This particular beading bit is a plunge version. Also referred to a plunge profile or plunge form bits. Designed to cut grooves with the edges of the groove displaying a particular profile, in this case a beading profile. Quarter-round profiles are formed by this bit as it grooves, one on each side of a flat. The scale and depth of the beading profile distinguishes it from the round-over above. 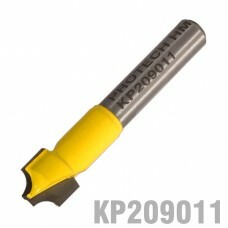 Used with a fence or edge guide, this beading bit can be used as an edge former. Mainly used for decorative work. This router bit has a 6,35 mm shank (shaft) that will fit most small routers. Please ensure that you select a router bit with a shank (shaft) size that will fit into your router collet.